The last lunar cycle unleashed large forces. Those in the Twin Cities, where I live, experienced the alarming clash between dissidents and the police state. We saw Sarah Palin, an ultra right-wing hockey mom, being offered the job of vice president by McCain. We saw the financial market fail and the government very afraid of what that may mean for the status quo. All of these things have been present for quite a while, but this month the turning point was reached. What had been simmering, exploded. Uranus and Pluto are the archetypes of such change. Uranus is the revolutionary and Pluto is the transformer. Pluto’s action is to release pent up forces that have long been held back. Uranus provokes the sudden event, which creates a new point of view, a new freedom, a change. Both of these planets are playing important roles in our current celestial story. And the story is far from finished. In January of this year, Pluto entered Capricorn, it stationed retrograde in April. Pluto traveled back into Sagittarius for a few months. Last month it stationed direct for the last time in Sagittarius and is making its way back into Capricorn at the end of November. Astrologers have been predicting for quite some time the kind of financial upheaval that we experienced this month. Capricorn rules such things as infrastructure, governments, and institutions upon which we rely for our survival. The financial markets qualify. Uranus in emphasized now by the approaching series of oppositions between it and Saturn. 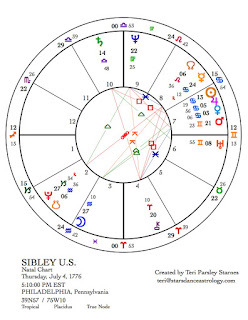 It is also transiting important degrees in the U.S. chart (known as the Sibley Chart). Last month, I wrote about how Obama and McCain share 22 degrees Virgo. Obama’s Mars is at 22 Virgo. McCain’s Venus is 22 Virgo. In the U.S. chart, Neptune is also at 22 Virgo and Mars is square Neptune at 21 Gemini. All this coincidence, familiar to astrologers, is telling us something. Uranus transits call us to awaken. Now is a time of awakening. Now, we should be looking at the Neptune square Mars dynamic of our nation’s chart. We are at a crossroads and these candidates are part of the choice. When I am at a crossroads, I like to invoke my allies. Who will help me see clearly? Who will help me choose wisely? What do I need to make my choice? Now is a time to call the allies to our aid. First, it may help to know better what we are encountering. Neptune square Mars in our nation’s chart. Mars is the warrior; the military machine; the will, force and passion of our nation. Neptune acts upon these qualities by casting glamour upon our perceptions. When we go to war, we need a dream, however true or false, to fuel our commitment. Mars is the energy of moving forward directly to get what we want. Neptune chills that energy, creating confusion or hesitancy. Mars is the energy of the ego. For a nation, we can say that Mars is the energy of the collective will. Neptune represents the illusions that will deceive us in executing that will. And it also represents the desire to have our will aligned with the good of the whole. Not everything about this dynamic of our national chart is bad. It also represents our national ideals and a belief that personal sacrifice can be a worthy choice for a worthy cause. Neptune represents ideals and illusions. The coincidence of our two presidential candidates sharing the Neptune degree at the same time that Uranus is transiting this degree (happens every 84 years) is extraordinary. How do we awaken from illusion and recommit to new ideals? Which candidate is best for us? Why are we almost evenly split, as a nation, between these two choices? What are we being asked to learn? Caroline Casey, on her brilliant radio show, reminds us to take our power and responsibility back. She suggests that we are not electing someone to save us. We are electing a story to animate. In other words: What do we want to believe in (Neptune)? How are we willing to act on behalf of that story no matter who is elected (Mars)? And who do we want to elect to better serve the story that we believe in? Last month, I wrote how setting intention helps us to gain clarity and self-knowledge. Using the energy of the celestial allies, I court alliance with what is possible now. I want to set intention for awakening from illusion and reinvigorating the foundations of our culture so that there is more justice, more sustainability, and more earth wisdom in our actions. Uranus and Pluto are willing allies. This New Moon is in Libra, the sign of the scales. It is important to investigate balance right now and seek to understand what balance means in our choices. Balance is the force of return, when a system is pushed too far in one direction, it corrects itself by pushing back in the other. A hurricane is a force of balance between hot and cold. Balance is a large force but it doesn’t have to be devastating. To live in balance means being able to correct easily, make fine adjustments, and respond to the needs of the moment. It means being mindful of where we are so that we can make those adjustments. Balance is consciousness, readiness, and trust in the force of correction. What goes up comes down. What is hidden is revealed. What is unfair is remedied. Balance is a force that conquers despair and hopelessness. We can choose balance. 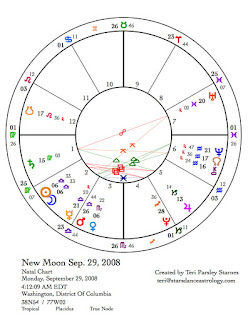 The chart for the New Moon of September 29 shows Saturn opposite Uranus. This opposition will be exact on Election Day. There will be a series of 5 oppositions between these two planets ending in July 2010. The last time these two planets opposed each other (again in a series of 5) was from 1965 to 1967. Culture changed radically during this time. This transit is a classic showdown between the forces of Order (Saturn) and Chaos (Uranus). Both are necessary. What is the balance point between them? How do we choose to work with these energies? What are you noticing? Mercury retrograde as ally for the crossroads. This Mercury is the trickster. He turned retrograde on September 24 and will turn direct on October 15. In the sign of Libra, Mercury can throw us off our equilibrium. If we invoke the awareness of Mercury retrograde—making changes in how we think and communicate and in what keeps us off balance and not mindful—then the trickster becomes a liberator. Do you dare to change your point of view? If so, then you have the right to invoke that change in consciousness in others. May Mercury reveal where we are stuck and the dead-end choices we have before us in this election. May it reveal the beliefs we want to animate and how to do so. October 6th may be the peak of trickster energy during this cycle. On this day, the Sun and Jupiter join Mercury in his shenanigans. 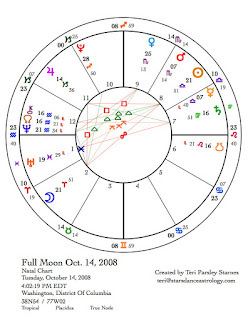 At the Full Moon on October 14, Saturn and Uranus are in closer opposition. The Sun and Moon are, of course opposed as well, and they square Jupiter. This Jupiter in Capricorn may push another crisis into the forefront of our awareness. This becomes another reason to choose a state of balance over a state of panic. As so much change is occurring around us and in our own lives, this lunar month is a good time to invoke balance. The best course for our world.